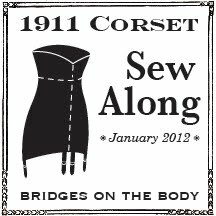 Thank you everyone who participated in the 1911 corset sew along! I couldn't have done this without you! Your input not only helped me with my own design questions, but more importantly served as a guide for instructions needed and also forced me to be organized. I'm still putting the final touches on my corset and will have photos soon. Yea! I thought I'd put links to all the steps in one place for future corset sewing. Here is a link to the flickr 1911 corset sew along group page where you can see images of the corsets in progress and finished work. Well done sewers along! I hope you've had as much fun making your corsets as I have! Thanks for the linkage! This page makes it so much easier for me to catch up. I just got back on track on this project. Got sideswiped by my Victorian outfit. I lack time management skills. Oh, that is useful, all my homework assignments in one place! My sewing machine should be reanimated soon and then I'll catch up. Thank you so much for organising this sew along, I would not have dared try and make a corset if it wasn't for your easy and thorough instructions! Might I ask what corset you are going to make after you are recovered from this one? After I knock back a mai tai to celebrate I'll pick up the 1650 bodice now that I've found it! Thanks so much! I've been following along but between grad school and weight loss success, I decided to postpone making a corset till this summer and now I can find all of your posts. Ooh, grad school, it eats up time doesn't it? But it should come first. Jump back in when you can! I am so behind, but I'll catch up. Is there a section on flickr for just the finished objects? would like to see a line up of everyones achievements. The flickr images are in the order they were posted. I'm thinking of posting links to the finished ones here so we can all ooh and ahh at everyone's nice work. by which I also mean thank you so so much for writing all this up. It's a fantastic resource and I am defintely going to look for another SAL when I have finished this project. Thank you for all you did for us! What a great resource! Once I have the mock-up together and I've tried it on (I'll be getting a bit of help with that), if I need any advice on fitting issues, will it still be possible to get the opinion of "the expert"? Made a lot of progress today, with the help of a friend to pinfit the parts I cannot reach. On my way to post pix, it's still too large but unsure where to slim it. Thank you Jo for being so generous with your time and expertise! Thank you! Thank you! Thank you!!! for being so generous and sharing this! Thank you for putting this together; I know it must have been a lot of work! I am finishing the flossing today, and am having a friend over to take photos of me in my finished corset (sans garter straps) tomorrow. Hopefully the light will cooperate! Thank you for the time and effort invested in making all this accessible to us. I will not sew along, but after you now. It's very encouraging to see all the photos of people's projects on Flickr. I have browsed more than once to get inspiration.